PHP Check - RSFirewall! Wordpress has created a php.ini but it does not work! Home / Support / Documentation / RSFirewall! (WordPress) / Frequently asked questions / PHP Check - RSFirewall! has created a php.ini but it does not work! RSFirewall! will attempt to fix your PHP settings if the configuration is not secure by creating a local php.ini file in the root of your hosting account. 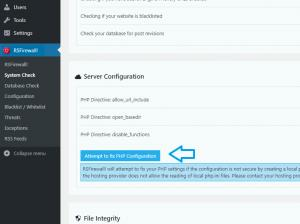 If the hosting provider allows this, the php.ini file will be read and the new settings will take effect. If it does not work, then it means that the hosting provider does not allow the reading of local php.ini files. Please contact your hosting provider and/or system administrator in order to get this enabled.